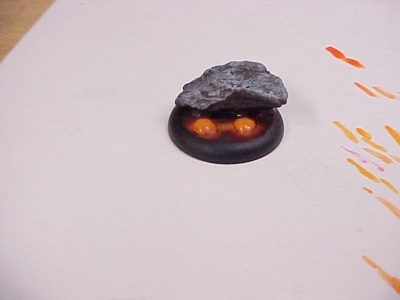 This article is in regards to a mini that I recently painted (90941). I have received much apreciated feedback/questions on her base and decided to write this article. 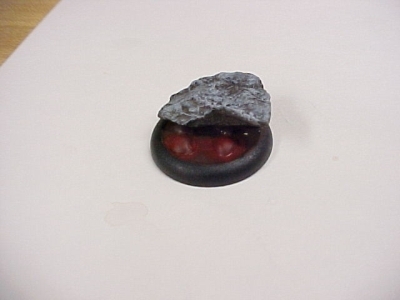 You are going to start out with a plastic base of any size. I prefer the rimmed basses but any type will work fine. 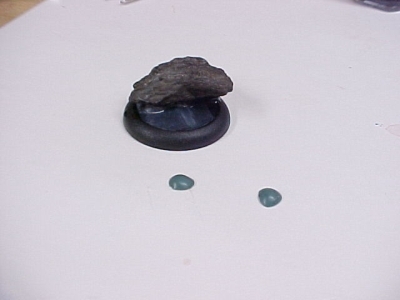 I then locate a rock which is glued on one side of the base. 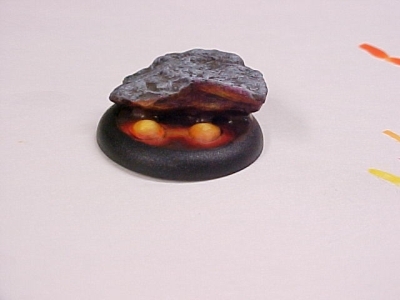 When selecting a rock I recomment finding one that will make it easier to paint your light sorce (OSL) . I like to pour in realistic water at this point. The reson being that it makes for a smoother painting surface but PVA glue will also work. This step does not need to be done just make sure that your base is smooth. Next I roll a small ball of green stuff and let it dry. Once it is dry I will cut off the top and the bottom of the sphere. These are going to be the bubbles inside of the lava. Now if you cut the sphere short you will have a small "just rising" bubble. If you leave much of the sphere (say half) then you will get a bubble thats about ready to burst. These two are about medium and roughly the same size. You can experiment with this making all different bubble sizes. 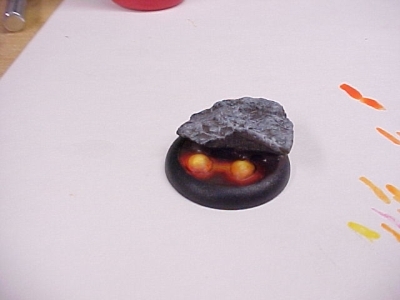 I then glue the two half spheres onto the bottom of the base. 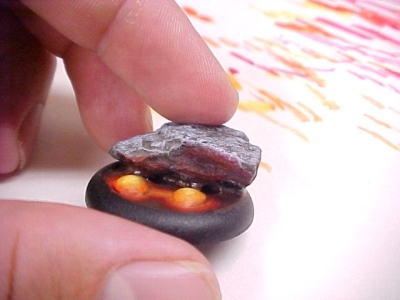 I also paint the rock a dark grey at this point. I will latter drybrush it in a lighter grey. 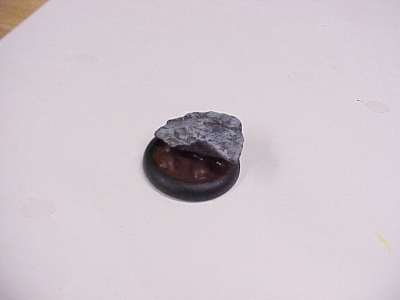 Next I paint the bottom of the base in a dark brown. Now I will start blending from red to yellow. During this I use watered down paints , about 3 water to 1 paint. I want a smooth shift from brown to red to orange to yellow. Now for my lighting effects. I am not going to go deep into this as there are numerous articles about this topic. Basically I am going to start painting reds and oranges along the rock where light would hit it. I always make these slightly darker then the original light sorce. If there are deep groves I will often use a watered down black ink to make shadows. Basically I just put a little bit of paint on at a time untill I get the desired effect. You can see that i need it a little bit lighter twoards the centers of the light reflections. I'll add some orange. Now I re-check my paint job and fix or smooth anything out. 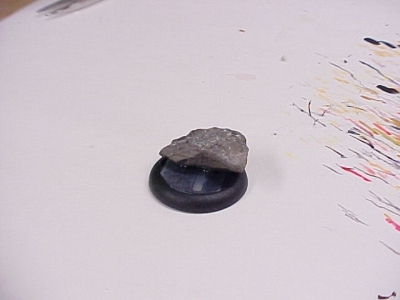 Paint the outside of the base black and glue the mini ontop of the rock.